Now in audio form (and read by the author), you can experience and learn an approach to selling that creates harmony... and revenue. If you could sum up How to Sell without Being a Jerk! in three words, what would they be? What was one of the most memorable moments of How to Sell without Being a Jerk!? I enjoyed all of the vignettes from professionals with experience in sales. I particularly enjoyed John's own personal stories about mistakes he made in the past and how he has learned from them. What does John Klymshyn bring to the story that you wouldn’t experience if you just read the book? As someone who owns both the book and the audiobook, the emotion -- that is, the delicacy with how sales should be handled -- comes across more clearly in the audiobook than the hardcover book. The fact that the audiobook is read by the author is an extreme plus. What did you learn from How to Sell without Being a Jerk! that you would use in your daily life? I have worked in sales for the past three years, but I don't have any formal sales training experience. That said, the anatomy of making a good sale was a strong point that I took away from it. Also, the overall strategic approach to getting through a batch of calls through what John calls a "twenty call burst" is something that I've employed since listening to his book. For the "Story" rating, I gave John's book 4 stars instead of 5 because it takes him some time in the beginning to get his legs underneath him and really dig into the weeds of how to be a good salesman. He establishes ethos in the first thirty or so minutes; John emphasizes his credibility. After that, he really digs in deep and gets to the brass tax of helping you improve in sales. While driving, I've played his audiobook multiple times (after his initial segment) and continue to gain pearls of wisdom. Some of the bad reviews for the physical book on Amazon's webpage (to me) seem to come from people who read the beginning of the book--where John was establishing credibility--and then cast the rest of the book aside. 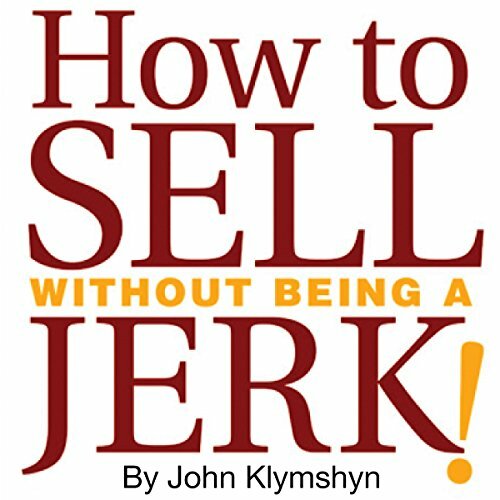 I don't think you will be disappointed if you soldier through that initial portion and get to the meat and potatoes of "How to Sell Without Being a Jerk." It's a very good read. Gone are the days or a rigid system of wearing down prospects and clients until they submit to an endless list of benefits. This audiobook is an easy listen with great tips on how to conduct selling conversations in a professional and ethical way. I would insist anyone within sales download this book today, right now - don't even wait until the end of this review! Personally I've just finished listening to this for the 3rd time and each time I've taken away something new and implemented it with success.